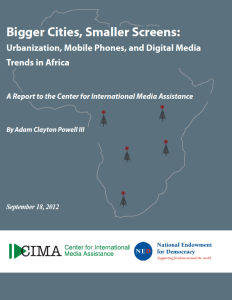 CIMA is pleased to release its latest report, Bigger Cities, Smaller Screens: Urbanization, Mobile Phones, and Digital Media Trends in Africa, by veteran journalism educator and media executive Adam Clayton Powell III. The convergence of African urbanization and technological change, including the rise of digital media, is driving major change on the continent. Perhaps most dramatic, cellphones and other mobile devices, already widespread, are becoming a nearly universal platform, not only for telephony but also for audio and video information and entertainment. This offers a fundamentally different “media” experience and has already led to an entirely new and largely unrecognized class of independent media–some newly created channels for international broadcasters–serving the African continent. This report traces the dramatic spread of mobile telephony in Africa and examines how this is affecting the news media landscape on the continent. Read the article on Tech President highlighting the report.